Add parsley, garlic, almonds, parm, lemon juice, salt, and oil to a mini prep processor and blend (or double and make in normal food processor to store and use later). Add additional oil if looser consistency is desired. 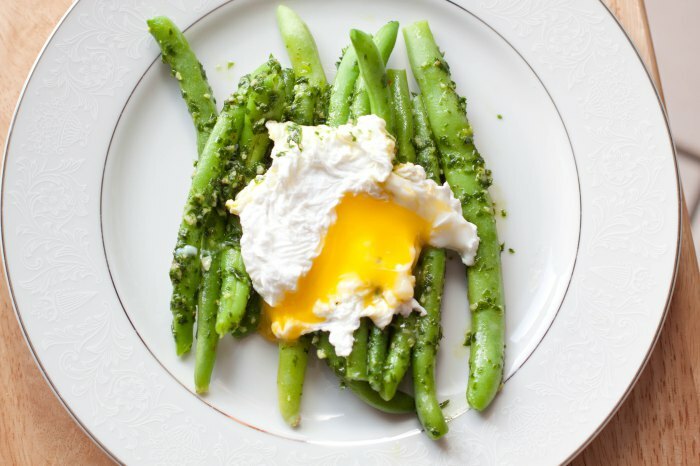 Clean and trim beans and blanch for 2-3 minutes. Remove from pot with tongs, shaking excess water off and put on a plate. Stir the same pot of hot water and add splash of white vinegar. When water has returned to a boil, stir water again and add egg in the middle of the spinning water (it will help prevent the white from 'feathering' out) and remove from heat. Cover and let sit for 4- 5 minutes. Add pesto to beans and mix so the beans are all coated. Add more shredded parm cheese if desired. When egg is done, gently place on top of beans and enjoy! 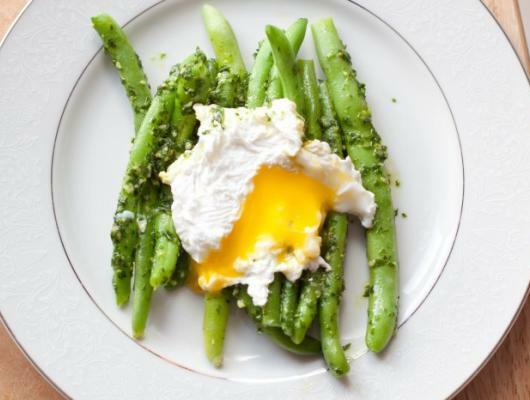 Garden fresh green beans mixed with a fresh parsley pesto and topped with runny yolked poached egg. This could be breakfast, lunch, or dinner!